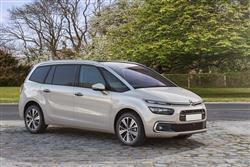 The Citroen Grand C4 Space Tourer brings a much needed injection of style to the compact five-seater MPV market. And there's practical substance to this most French of People Carrying propositions. Plus it now gets a higher-performance flagship 2.0-litre BlueHDi 160hp diesel engine. 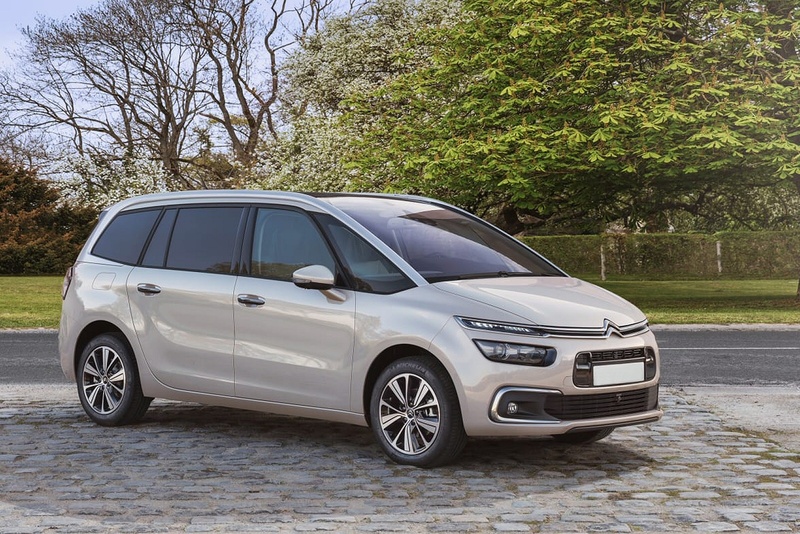 Citroen's classy, glassy Grand C4 Space Tourer aims to offer the most practical, the most versatile and the most elegant solution to families shopping in the seven-seat mid-sized MPV segment. It's a sector aimed at those who need either a big boot or the option to take more than five folk, but don't want the sheer size and expense of a large segment People Carrier. If that's you, then you'll find that this now more efficient and sophisticated French contender takes care of the basics of space, safety and cost-effectiveness with ease, but where this model really excels is in the other things: style, technology and a very emotive feel. By People Carrying standards, it's a bit special. Especially in this top BlueHDi 160 diesel guise. On the move in a Grand C4 Space Tourer, the driving experience is a little bit different from what it would be in other rival family MPVs. There isn't much fun to be had in terms of driving dynamics but in compensation, you float over road imperfections, marvel at the unusually hushed levels of refinement and enjoy the benefits of a commanding driving position that's a huge help at roundabouts or when parking and, with this panoramic screen, makes it seem like you're suddenly viewing the world in high definition. Under the bonnet, much has changed since this car's original launch, Citroen having updated all of its mainstream engines in more recent times. The 2.0-litre BlueHDi diesel option gets a slight power hike too, to 160hp - which is the package we chose to try here, one that only comes with a much smoother eight-speed 'EAT8' auto gearbox. This flagship version makes 62mph in 9.2s en route to 130mph and is worth looking at if you're regularly going to be towing, using the car fully loaded or travelling longer distances. Citroen is a brand with a heritage in design flair. The aesthetics still get your attention, with a distinctive three-tiered light signature and a windscreen that flows right up into the roofline. Up-front, the first thing your Citroen sales person will show you is the Panoramic windscreen. Push up the sun visor and your normal upward 28-degree angle of vision is increased to a massive 108-degrees. The dashboard is dominated by twin screens. Virtually all new cars have some sort of central infotainment screen these days like this Citroen's tablet-style 7-inch 'Touch Drive Interface' lower display, but more unusual is this car's snazzily futuristic 12-inch panoramic HD panel up top which replaces the normal set of conventional-dialled instrument gauges. And in the second row? Well, there's a completely flat floor and a rear cabin seating area made up of three separate identically-sized chairs that can be reclined and folded flat independently of one another. They can be slid backwards and forwards too. And further back? Well Citroen reckons that it's class-leadingly spacious in the third row, but that still doesn't mean it'll be especially comfortable for two tall adults on a long trip. Having said that, we need to be fair about this: no mid-sized MPV of just 4.6m in length is going to be able to offer that. And the boot? 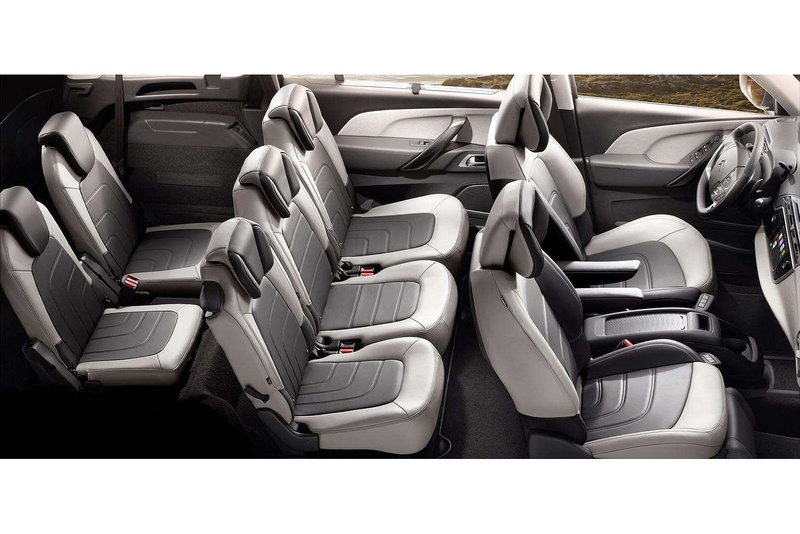 Well the restricted luggage space with all the seats in use won't regularly be an issue for most likely buyers, given that much of the time, they'll be using this car with the third row chairs folded into the floor. Do that and you'll find that with all three sliding middle row chairs pushed right back, there's 632-litres of space on offer. Push them all forward and that figure rises to 793-litres. Where this Citroen's spaciousness really is impressive though, is when you're able to fold both second and third row seating and use all the luggage space it can offer - a full 2,181-litres. The top BlueHDi 160 version of this Grand C4 Space Tourer comes in two guises - 'Feel'-spec (for around £30,000) and top 'Flair'-trim (for around £32,000). Both come only in auto gearbox form. The 'Feel' variant gets 17-inch 'Mamba' alloy wheels, rear privacy glass, along with puddle lights in the doors and front parking sensors. Inside, the 'Feel'-spec Grand C4 Space Tourer BlueHDi 160 model gets a smarter interior trimmed with what Citroen calls its 'Wild Blue' ambiance. Perhaps more significantly, occupants will enjoy niceties like Citroen's 'Connect' navigation system, a massaging function for the front seats and aluminium front sill scuff protectors, plus you get the 12-inch panoramic HD colour central instrument display that for us, is really a key part of the interior's futuristic appeal. In addition, there are useful features like underfloor storage compartments at the rear and back seat bases that slide. The front seats incorporate lower drawers and are embellished with arm rests, plus there's height adjustment and a fold-flat function for the front passenger seat. The top 'Flair' version adds 18-inch wheels, part-leather seat trim, a panoramic roof and a self-parking system. Citroen has worked hard to improve the efficiency of its engine range in recent years and it can now stand toe to toe with the very best. The 2.0-litre BlueHDi 160 diesel comes only with the EAT8 auto gearbox. The figures are 60.1mpg and 123g/km for a 'Feel' model with 17-inch wheels - the variant we tested; obviously, you'll do fractionally worse with top-spec 'Flair' trim and its larger 18-inch rims. The Benefit-in-Kind taxation rating you're looking at for the 2.0-litre diesel is either group 29 or 30. Servicing intervals are every year or every 20,000 miles. On to residual values. Independent experts reckon you'll get around 41% of your initial purchase price back after three years - which to give you some perspective is close to the kind of return you'd get from a comparable Volkswagen Touran model. We'll finish by briefing you on insurance. This 2.0-litre BlueHDi 160 variant is rated at group 27E with 'Feel' trim or group 29A with top 'Flair'-spec. Finally, there's the usual Citroen three year / 60,000 mile warranty. If you�re looking for a new Citroen Grand C4 2.0 BlueHDi 160 Feel 5dr EAT8 Diesel Estate for sale, you�ve come to the right place. At Bristol Street Motors we don�t just have the best Citroen Grand C4 2.0 BlueHDi 160 Feel 5dr EAT8 Diesel Estate deals, we also offer friendly advice and help with all your enquiries to ensure your buying experience is a happy experience.